Banner Maxx provides fast and balanced systemic movement. It is the first choice broad spectrum fungicide for curative disease control. Banol turf fungicide delivers preventive and curative systemic protection against Pythium species associated with Blight and Dampening-off, with very low potential for resistance. Civitas is a two part system intended to be used with Civitas Harmonizer. Civitas treats disease and works to prevent diseases from taking hold in the first place with no known resistance risk. A unique Mode of Action in Civitas is Induced Systemic Resistance (ISR). Civitas helps turf become healthier and therefore less prone to stress. In addition, Civitas provides a barrier that helps prevent pathogens from accepting or using the host plant. Compass fungicide is a broad-spectrum strobilurin fungicide that offers a revolutionary mesostemic mode of action delivering the highest efficacy at very low rates against turfgrass diseases, especially Brown Patch, Anthracnose, Leaf Spot, and Gray Leaf Spot. Concert fungicide provides golf course superintendents with preventive and curative disease control on all playing surfaces by using a proprietary blend of the active ingredients from Banner Maxx and Daconil. Daconil Ultrex is water dispersible granule formulation containing 82.5 % Chlorothalonil. Daconil Ultrex has a built-in surfactant, adjuvant and compatibility system called WeatherStik. The WeatherStik technology provides extended protection, even after heavy rains or irrigation. Daconil 2787 is a contact fungicide that targets multiple sites in the fungal pathogen. Exteris Stressgard is a new fungicide in the SDHI class of chemistry that is combined with trifloxystrobin to provide long-lasting, preventative and curative control of foliar turf diseases. Heritage Maxx is the only systemic strobilurin translocated upward through the roots, crown, stems and leaves, protecting the entire plant. Heritage Maxx is effective against root-borne disease due to its ability to be taken up quickly by the roots and because of its systemic and curative properties. Instrata fungicide is the foremost product for protection against both Pink and Gray Snow Mould. Its combination of 3 active ingredients is uniquely capable of outperforming conventional snow mould products and tank mixes. Instrata II fungicide is an advanced formulation consisting of a combination of Instrata II A and Instrata II B. Instrata II is the foremost product for protection against Pink Snow Mould. Kabuto fungicide delivers a new and unique active ingredient for powerful Dollar Spot control. Kabuto makes an excellent alternative to DMI (Group 3) chemistry when trying to manage fungicide resistance. Medallion is a broad-spectrum, contact fungicide that offers protection against several damaging diseases, including Fusarium Patch, Anthracnose, Leaf Spot, and Brown patch. Mirage Stressgard provides broad-spectrum control of important diseases like dollar spot, anthracnose, summer patch, fairy ring and snow moulds on fairways, tees, and greens. Tebuconazole powered by Stressgard Formulation Technology provides a great solution for tough diseases, while minimizing negative turf growth regulator effects that are seen with other DMI fungicides. The original and trusted turf growth regulator that pre-conditions for stress and optimizes surface quality and resources. Renovo is a broad spectrum systemic fungicide that offers golf courses a unique mode of action. Renovo is the only FRAC Group 1 fungicide registered for control of turf diseases in Canada. This makes Renovo an effective tankmix or rotational product. Signature Stressgard (formerly Aliette Signature) is a unique, highly systemic fungicide that represents an invaluable tool in preventing diseases related to stress like the Pythiums spp. With its complex mode of action, Signature Stressgard is also known to improve turf quality by enhancing the plants defense mechanisms and vigour. Signature XTRA Stressgard is a true systemic fungicide that enhances plant health and minimizes stress from both abiotic and biotic sources. Signature XTRA Stressgard uses a new, improved formulation of fosetyl-AL. Fosetyl-AL, the same active ingredient used in Chipco Aliette Signature, that has provided over 20 years of proven Pythium control and consistently high turf-quality ratings, along with no documented reports of resistance development in the field. Subdue Maxx systemic fungicide provides outstanding Pythium Control for all seasons. Trilogy with Stressgard formulation technology combines winter long triple protection against Snow Moulds and improves turf quality. Velista fungicide is the only SDHI labeled for Anthracnose in the golf market. Velista also protects against Dollar Spot, Brown Patch, and more. Ideal for spring and fall clean up on greens, tees and fairways. Click here for fungicide application rates and appropriate usage guidelines. 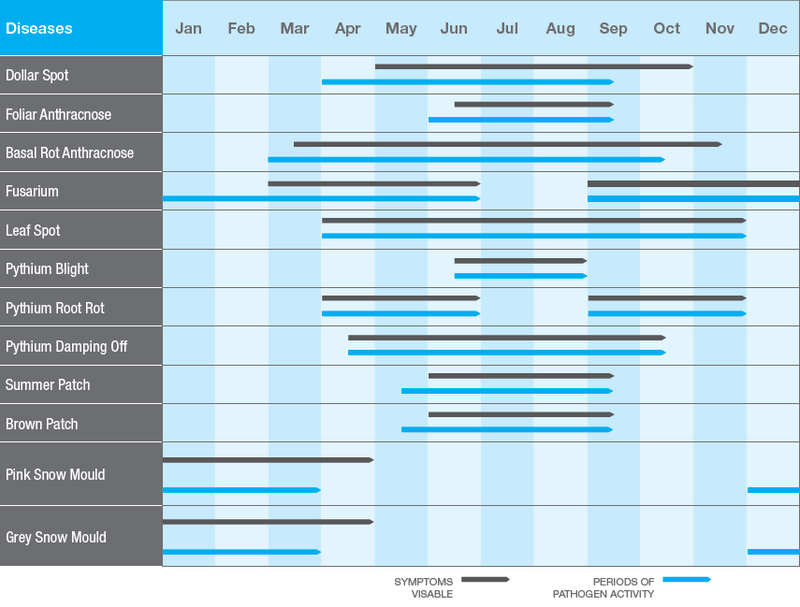 The following chart has been adapted from Bayer's Turf Products Guide. The full guide is available by clicking here.